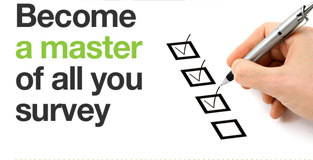 Design : Build your own surveys or choose from our templates. Collect : Choose how to distribute and start collecting responses. Analyze : Use our powerful analytical tools for intelligent insights. Fast : Launch surveys in minutes. Get results in real time. Turn data into decisions with powerful analytics. Innovative : Stay a step ahead. Identify opportunities. Use the latest technology to get closer to customers, partners and employees. For everyone : Easy to use. Empower everybody in your organization to make the best decisions every day.